Ha-Neul Kim is one of the best players in women's golf today who does not play on the LPGA Tour. She's 23 years old, from South Korea, and she plays on the KLPGA. And she's very successful there. Ha-Neul has seven career KLPGA victories, including three in 2011 and one in 2012. She's off to a hot start at the 2013 U.S. Women's Open as this is written, near the first-round lead. I, for one, would love to see her on the US LPGA, and soon. Not many golfers get to say they won their very first tournament playing as a professional. But now, Jennifer Kirby can. The Canadian golfer won the CN Canadian Women's Tour Quebec tournament on June 12, her first event as a professional golfer. 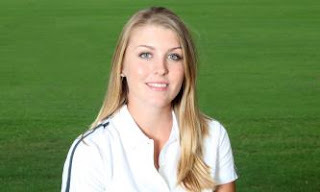 Kirby turned pro following the completion of her collegiate career at the University of Alabama. The 22-year-old put herself on the map back in 2009, when she won six amateur tournaments in Canada. Those titles included the Ontario Amateur, Canadian Junior Amateur and Canadian Amateur championships. Kirby played four years at Alabama, earning SEC Freshman of the Year honors in 2010. She was a three-time all-conference selection and an All-America choice in 2012. Kirby won one NCAA tournament and posted 12 Top 10s, and was a key part of the Alabama team that won the NCAA championship in 2012. She has become a regular guest at Buckinghamshire Golf Club, which is hosting the ISPS Handa Ladies European Masters and hopes that it will give her an edge on the competition when the event takes place on July 26-28. The article states that Nicollet " brings a breath of fresh air to the British golf scene" and notes that she has a burgeoning career as a model, too, doing shoots for (among others) Vogue, Marie-Claire and Elle. Sharmilla has won on the women's circuit in India this year, and her top showing so far this season on the LET is a tie for 17th in Turkey.